No matter how high you turn up the heat, boiling water cannot surpass 212F (even lower at high altitudes). 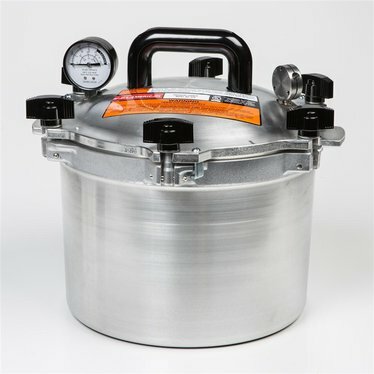 Our High-Quality Pressure Canners bring jar temperatures up to 250F at just 15 lbs sq. in. 100 percent bacteria kill guaranteed! Our pressure canners are more expensive than some but they are a once-in-a-lifetime investment. So carefully crafted they seal steam-tight with NO gasket to crack, clean or burn. Exclusive metal-to-metal seal withstands more pressure than gasketed seals, too. Sides are .25" thick. Bottoms are even thicker and machined for perfect surface-to-surface heat transfer. All cast aluminum for generations of use. Simple and safe to use so there is no need for close supervision since pressure cannot exceed setting (5, 10 or 15 lbs). Over-pressure plug acts as back-up. Stay-cool bakelite handles, easy-to-read pressure gauge and detailed owner's manual with recipes and canning hints. 15-1/2 Quart: Jar Capacity: 10 pt or 7 qt. Dimensions: 7-1/2"H x 12-3/4"ID (12-1/2"H with lid), 17 lb. Purchased our All American canner with our wedding gifts ten years ago. LOVE this canner. I have cooked roasts in it, canned soups, vegetables and pickles with it. Reliable and easy to use, very safe, and a great tool in the kitchen. I would not be without it. Can't recommend it highly enough.